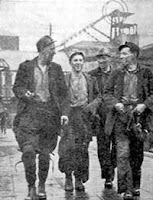 2012 has been the centenary of the great miners’ strike of 1912, the biggest strike the world had seen at that point in history, with around a million workers taking part. My paternal grandfather, Henry Smith Pinkney, was born into a mining family in the north-east of England in 1894, so in 1912 he was 18 years old and a miner himself. It seems highly likely (particularly in view of his later membership of the Communist Party) that he was an eager participant in that strike, though I have no documentary proof of this. So I’m glad to find Jane Morris writing on 4 March 1912: ‘miners ought to be paid at least twice as much as they seem to get, and all the owners & Jews & financiers & idle rich people generally ought to work in the mines at least one day a week, perhaps by this means a little sympathy might be produced between the different classes’ (p.451). Her comment is certainly not as radical as Morris himself on the 1893 miners’ strike, and rather more in the spirit of that class-collaborationist handshake between foreman and boss at the end of Fritz Lang’s film Metropolis. But even so, I’m delighted that Jane Morris broadly sympathised with my Grandad’s political activities in the early years of the twentieth century. Was D.H. Lawrence's father (also a miner) part of the 1912 strike too, I wonder? Only a year before 'Sons and Lovers' was published, after all. .....and the ugly reference to 'Jews' ?? ?